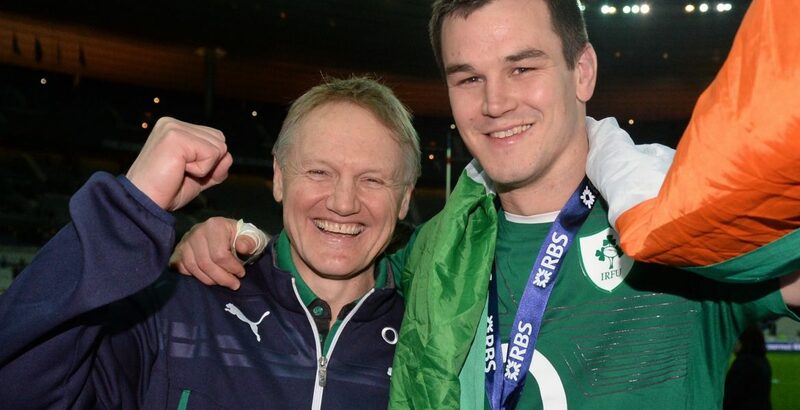 Ireland fly-half Johnny Sexton has revealed his first impression of Joe Schmidt was that he was "too nice" to be a head coach. The pair have formed a formidable winning partnership for almost a decade with Leinster and Ireland. "I thought he was a bit too nice to be a head coach - how wrong could I have been?" Sexton told the Rugby Union Weekly podcast. "He is in fact the most ruthless man I have ever met in terms of preparation." New Zealander Schmidt, who has led Grand Slam champions Ireland to three Six Nations titles, is to stand down as head coach after the 2019 World Cup. In a wide-ranging interview, Sexton recalls a meeting with Schmidt before his appointment as Leinster boss in 2010. "I remember meeting him probably eight or nine years ago in Leinster along with [other Leinster players] Leo Cullen and Jono Gibbes. "Leinster had interviewed him and thought he could be the guy going forward, and they said they wanted a few of the players to meet him. "After the meeting Leo and Jonno asked me what I thought; I said I thought he was a bit too nice to be a head coach - the boys still slag me about it now." Schmidt went on to win two Heineken Cups at Leinster before taking over at Ireland in 2013, where he has also masterminding two historic victories over New Zealand. Sexton has been an ever-present in those teams, recently winning the coveted World Rugby player of the year award for 2018, with Schmidt scooping best coach. "Joe has been a huge part of my career in terms of helping me develop as a player," Sexton said. "As a 10 you are only as good as the guys around you, and the coach plays a pivotal role in terms of having the group organised and giving you a clear gameplan." A life-long Manchester United supporter, Sexton says he has taken inspiration from their 1998-99 Treble-winning captain Roy Keane when it comes to setting standards on the field. "What people don't realise is that when you have a go at someone [during a game], you put massive pressure on yourself," Sexton explained. "Communication is a big part of the position I play, and I try and manage the team as best I can. "Roy Keane was a hero of mine. He always produced on the big days and I am sure it was similar for him with that leadership role." With Ireland targeting World Cup glory next year, Schmidt announced last week he will leave his role after the tournament in Japan, with current defence coach Andy Farrell stepping up to replace him. Sexton has endorsed Farrell's appointment, and believes the former cross-code international will put his own stamp on the side. "Andy will have taken a lot of Joe's intellect and learned a lot from Joe, but he is very much his own man," Sexton said. "There is one thing for certain, we will be playing for him, because he is such a good coach himself, and such a good person." Listen to the full interview with Johnny Sexton on the Rugby Union Weekly podcast, which will be available to download soon.